There’s a small crowd around the custom V-twin in the parking lot. Unlike most custom machines, it’s very obviously not meant for styling at the local burger joint. 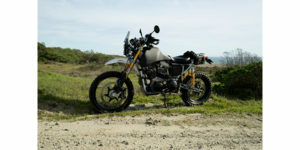 The dual sport Carducci prototype has taken its rider on numerous desert-riding adventures, including a three-day tour through the Mojave Desert. 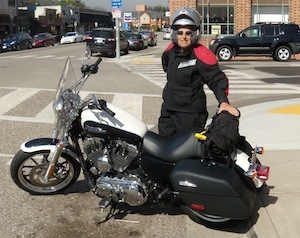 “It does well for a bike of its size,” said Jim Carducci, the builder. Carducci has always liked to see what makes things tick. As a youngster, he took his first bike down to the frame and then rebuilt it. When he started racing off-road, he built the suspension for his racer. Given his proclivities, it’s no surprise that he went to work as an engineer. “The most important things I learned over the years were paying attention to detail, never giving up and how to thrive while doing consistently difficult work in a tough environment,” Carducci said. Starting with a 2003 883 Sportster engine, modified with a big bore kit and Andrews cams, and a modified Sportster frame, Carducci extended the swing arm and increased the rear suspension travel to suit dual-purpose riding. All of the other parts were either designed and built by Carducci, or obtained from reliable aftermarket sources. He is experienced with CAD design, and thoroughly stress-tested all components prior to building the prototype. This dual sport bike fills an open niche for American-built motorcycles. Carducci is now looking for a company to take on the production of his machine. He emphasizes that all parts are thoroughly documented and reproducible. A second bike has been built from the prototype specs.